Saturday morning always starts with me thinking about what I want to get accomplished in two days. My days are long at work and most days I don’t feel like doing much once I get home. My job this morning is to take stock of my pantry and dig out my pantry supply list. I took about 30 minutes to organize and tidy up my pantry. As I was taking stock I pulled out my pantry supply list that I keep and started writing down a shopping list to get things stocked back up. There is nothing I like more than to find a new recipe and know I have everything I need to make it. I love this pantry supply list and have kept it in my cookbook for years. 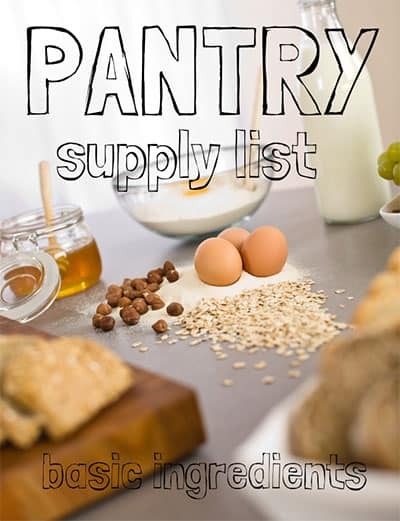 I wanted to share the pantry supply list that I have used for years. Having a well stocked pantry can make cooking a joy. My pantry supply list may not look like yours, but it is a good list of what items are used most often in the recipes I make. This post is linked up to many of my favorite blog hops and link parties. Won’t you go visit some? Good lists, the fall hunting sounds wonderful, I need to can a good amount more lamb to make way in the big meat freezer for the coming whole pig, the veggie freezer is full already, and we will have lots to bring in but mostly for the root cellar. Walnut oil? I’m not familiar with that. Is it particularly good for certain types of cooking? I found walnut oil in a specialty store last year and it makes great salad dressing. It is expensive so I don’t think I would go out and buy more but I love it with some balsamic vinegar over a fresh salad. It does not heat well so dressing is all I have ever used it for. I would like to suggest also having Kosher salt. This salt is useful when making pickles and baked potatoes are good greased and rolled in kosher salt. Kosher salt is used in several recipes. May I also suggest Corn Meal. For cornbread and french bread and frying fish. i also keep Molasses on hand. Molasses with a little soy sauce makes a great teryakia sauce. I have been dehydrating my over supply of onions to make my own onion powder and onion salt. Plus dehydrating the green tops for chives. They keep will. Making your own Garlic powder by dehydrating garlic is also great for preserving your own spices. Thank you for your blog I really enjoy reading all your articles. 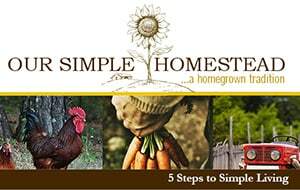 I am striving to live a simpler lifestyle and being more self reliant. Donna those are great additions! Thanks for sharing them with us.